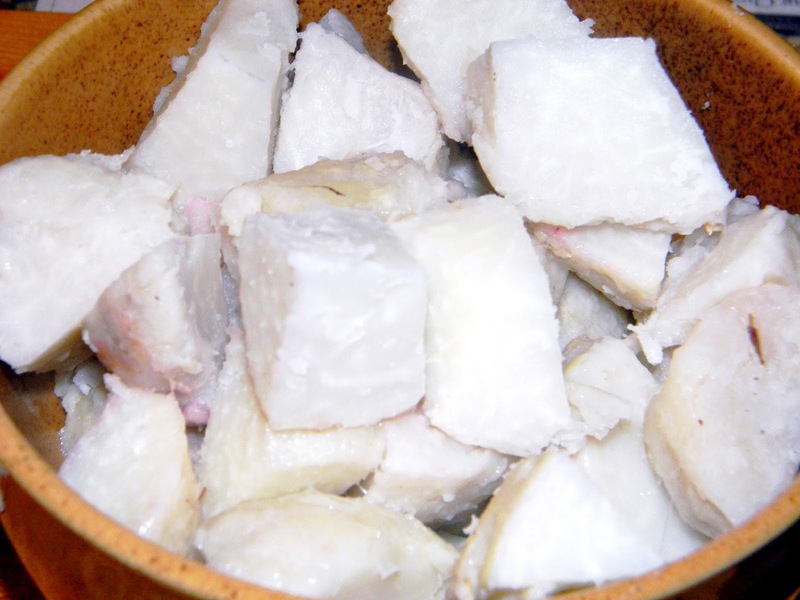 Colocasia/ Taro/seppankilangu/Arbi is a starchy root vegetable which is widely consumed in Asia, India and south America. This vegetable can be used for roasting, baking or deep-frying. I got this recipe from my mother-in-law, who is a great cook. This dish is very simple to make with oil and spices. Its great to eat with sambhar rice or rasam rice or curd rice. But I love to eat with beetroot sambhar. 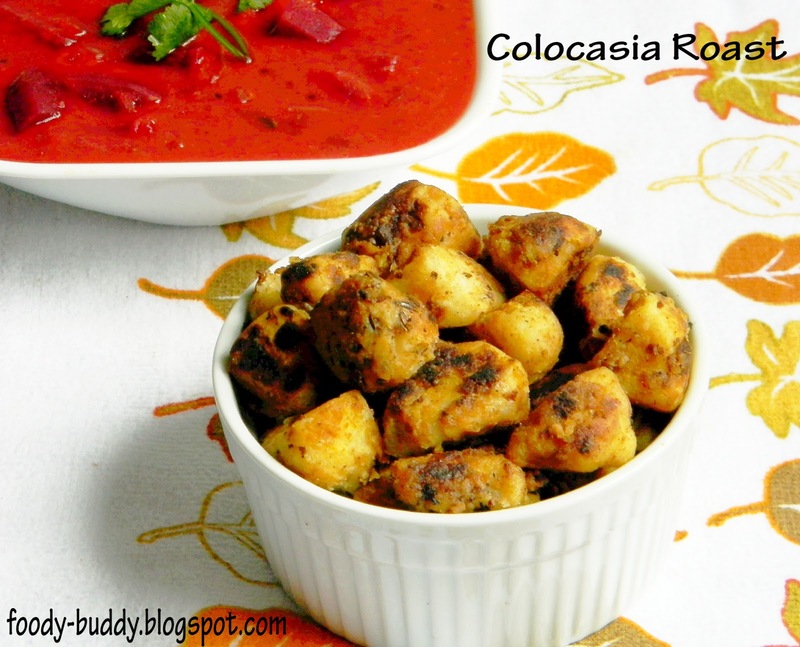 You can find two colocasia recipes here. One is roasted and other one is deep-fried. 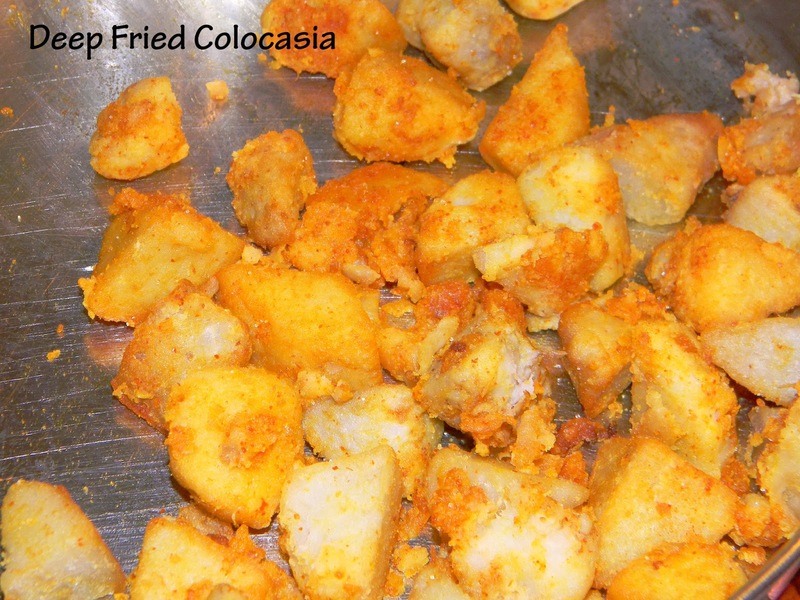 Wash and pressure cook colocasia with 1 cup of water and wait for 2 whistles. Switch off the stove. Wash in cold water and peel the skin and cut into small cubes. Keep it aside. In a bowl, marinate the colocasia pieces, turmeric powder, sambhar powder and salt. Wait for 5 mins so that colocasia absorbs the masala. 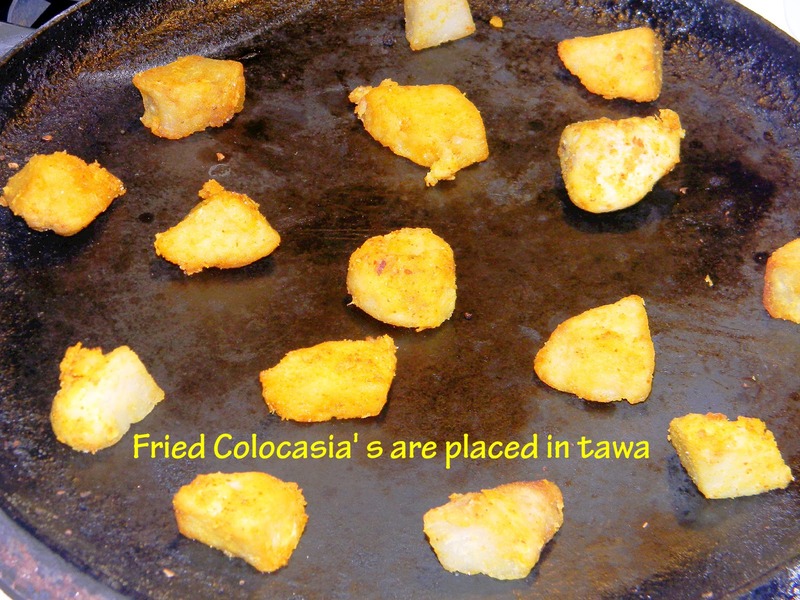 Take a non-stick pan with oil, add the marinated colocasia and fry for 5 mins. Add fennel and garam masala. Mix well. 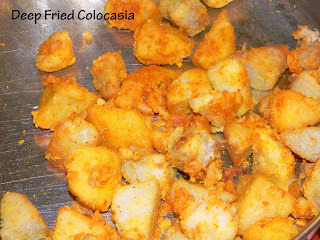 Cook for 7-10 mins in medium- low flame until it is dark-golden brown and crispy. once it done, switch off the flame. Seppankilanghu or Colocasia Roast is ready to serve. 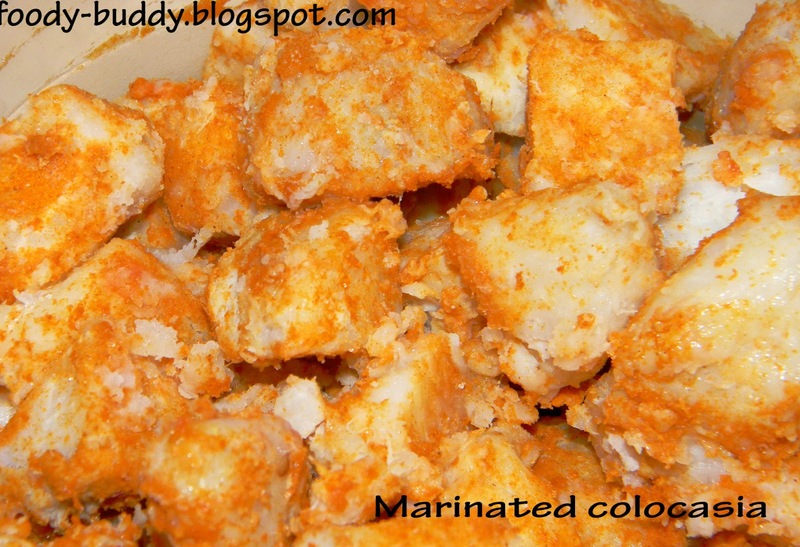 Peel the skin and cut into small cubes.Keep the bowl in fridge for 30 mins. Take a shallow pan with oil , deep fry the colocasia pieces until it turns light brown colour on both sides. Take a tawa, place all the pieces and cook on both sides until you find black spots. 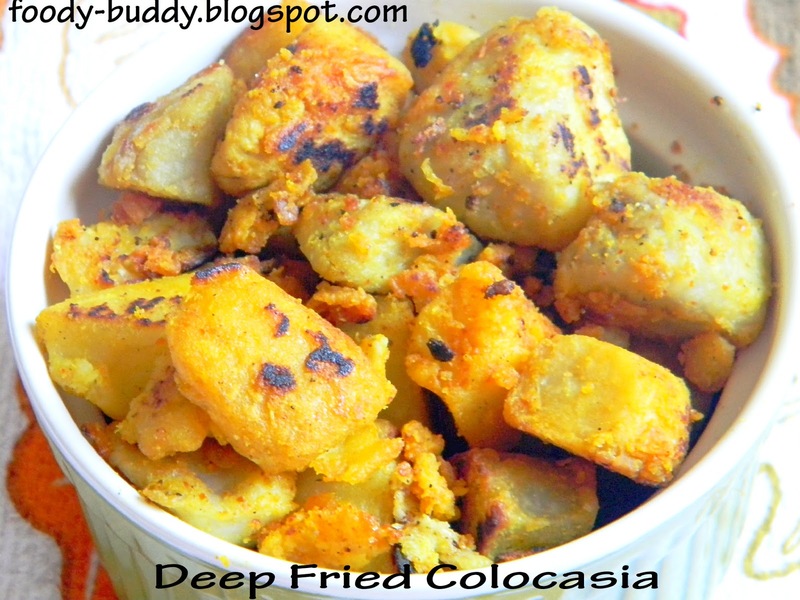 Deep fried colocasia is ready to serve. Good accompaniment for sambhar or rasam or curd rice. You can add more chilly powder for extra spiciness. You can add rice flour while marinating the colocasia for extra crispness. 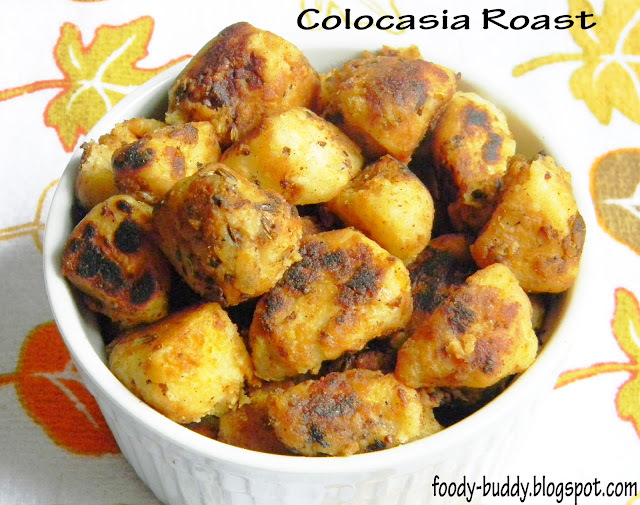 Make sure that colocasia are not in pressure cooker for not more than 2 whistles otherwise it turns mushy. 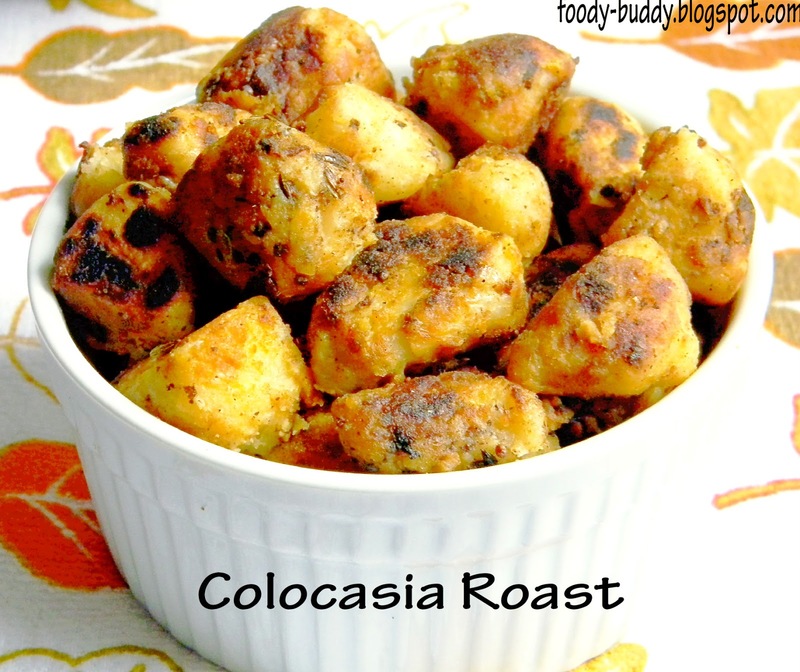 Colocasia are high in calories than potatoes. Finest source of dietary fibers. Rich in Vitamin A, C, B, E, K and minerals and anti-oxidants.